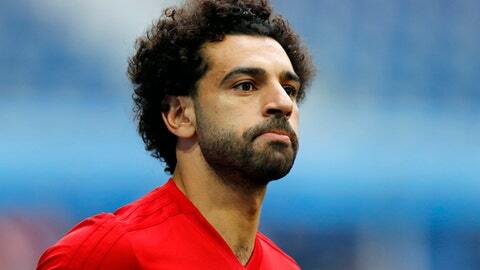 VOLGOGRAD, Russia (AP) Chechnya leader Ramzan Kadyrov has granted honorary citizenship to striker Mohamed Salah at a banquet held to say goodbye to Egypt’s World Cup squad. The Pharaohs, as the Egyptian squad is known, adopted the Russian region’s capital, Grozny, as their base for the tournament, a choice that has raised eyebrows given Kadyrov’s poor human rights record and the long distances involved in the team’s travels to group matches elsewhere in Russia. The banquet Friday night was held at Kadyrov’s presidential palace in Grozny, and the Chechen leader posed with Salah for pictures while pinning a medal on his chest. ”It is a deserved honor,” Kadyrov wrote on Russian social media, adding that Salah’s presence had driven ”unprecedented interest in football.” He said he now wants Egypt to return to Chechnya after the World Cup for a friendly against local club Akhmat Grozny, which is named after Kadyrov’s father, who was assassinated in 2004. A video clip of the ceremony posted on social media networks showed Kadyrov seated at the dinner table flanked by Salah and Hany Abo Rida, chairman of Egypt’s football federation. It also showed the Chechen leader autographing a striped green-and-white Akhmat Grozny jersey and presenting it to Salah amid polite applause by the rest of the Egyptian squad seated at separate tables. It was the third time in two weeks that the Chechen leader, a Moscow-backed former rebel and a keen sports fan, has shown his admiration for 26-year-old Liverpool striker Salah. Kadyrov attended Egypt’s first practice session in Grozny on June 10. After watching for about 30 minutes, he drove to the squad’s nearby hotel where Salah, nursing a shoulder injury, was relaxing in his room. The Chechen leader asked Salah to accompany him back to the stadium, where the two later posed for photos and greeted the 5,000 fans who had tickets to watch Egypt practice. According to Egypt’s football federation, the Chechen leadership sent a large cake to the team hotel on June 15 to mark Salah’s 26th birthday, which coincided with the Pharaohs’ 1-0 loss to Uruguay in their opening match of the World Cup. It was Egypt’s first match at the soccer’s biggest tournament in 28 years. Kadyrov’s habit of hosting celebrities such as Salah appears designed to associate him more with sports than his track record as an authoritarian leader. He lured soccer greats Diego Maradona, Luis Figo and Steve McManaman to Grozny in 2011 for an exhibition game marking the opening of a new 30,000 seat stadium. Last year, Brazil’s Ronaldinho posted photos of himself with Kadyrov during a visit to Grozny, and boxer Floyd Mayweather lavishly praised Kadyrov while they were being filmed together in the Chechen capital. Kadyrov is under sanctions imposed by the United States, which accuses him of human rights violations. His rule has been marred by numerous reports of extrajudicial killings and torture in the republic which saw two devastating separatist wars. Recently, he came under pressure when widespread reports surfaced of a broad crackdown on gays in his region. He insists, however, there are no gay people in the region. It is against this backdrop that Salah’s meetings with Kadyrov carry the potential to hurt the Egyptian player’s image as something of an ambassador of moderate Islam. Salah had a stellar first season with Liverpool this year, scoring 44 goals in all competitions and winning the Premier League’s best player award. He enjoys the adulation of millions of fans at home and is a role model for children aspiring to be footballers. Egyptian team officials have dismissed criticism of their choice of Grozny as the team’s World Cup headquarters, contending that the city was on FIFA’s list of approved bases and that conditions there were a perfect fit for the team. The Egyptians were leaving Grozny on Saturday for Volgograd, where they will play Saudi Arabia in their last group match on Monday. Both teams have already been eliminated from the World Cup. AP Sports Writer James Ellingworth contributed to this report from Moscow.